It’s just so awesome to see that finally Brawl Stars has made it to the Global Launch after a year and half. This is such a great success of the game and of course it’s just the beginning! Below are the two links for you to download Brawl Stars! Close then reopen Google Play. Go to Settings => Application => Google Play => Clear Cache => Force Stop then Re-open it. You should be able to download the game now. Soft Launch Release: Canada, Sweden, Norway, Denmark, Finland, Ireland, Malaysia, Macao, Singapore, Hong Kong, Russia. Hey guys, I am going to show you how to download Brawl Stars from any Country outside Canada! We are in the soft-launch phrase at the moment. Thus, Brawl Stars is only available for download in Appstore Canada. More countries will be unlocked very soon in this soft-launch phrase. The game will also be available on Android very soon! 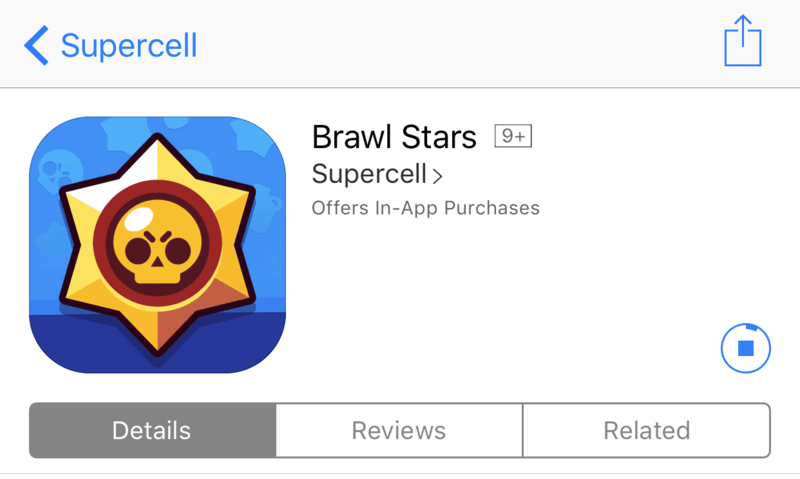 So, If you are not from Canada, there is an easy way to download and install Brawl Stars on your iPhone/iPad! On your iOS device (iPhone/iPad/iPod etc) to go the Settings menu, scroll down and open iTunes & App Store. Tap on your Apple ID at the top (You need to sign in with your Apple ID first). Enter your password If asked. Apple will give you a list of all countries, scroll down and choose Canada. (We are changing our Appstore to Canadian Appstore to download Brawl Stars). Choose Agree in the Terms and Conditions page. Fill out the form like the screenshot below. 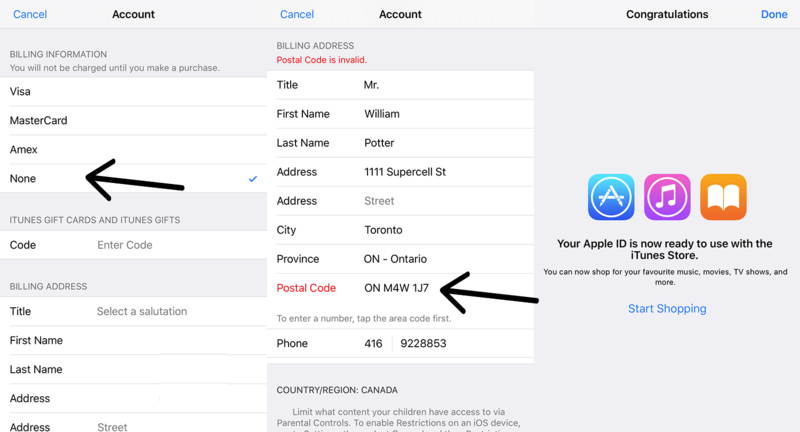 Actually you can use any fake address and name, just name sure you use the right Postal Code and Phone Number format. Remember to choose None in the Billing section! I have some fake information here for you to use (Provinces/Postal Code/Phone). You can go to this website to grab your own one. Check again then press Next. Agree with any ToS from Apple If asked. Now you can open Appstore and search for Brawl Stars guys! If somehow you can’t find the game on Appstore, this is a direct link leading to it! I have been playing this game for about one hour now. It’s very cool guys! If you have any question, don’t hesitate to ask. I will try the best to help you out! 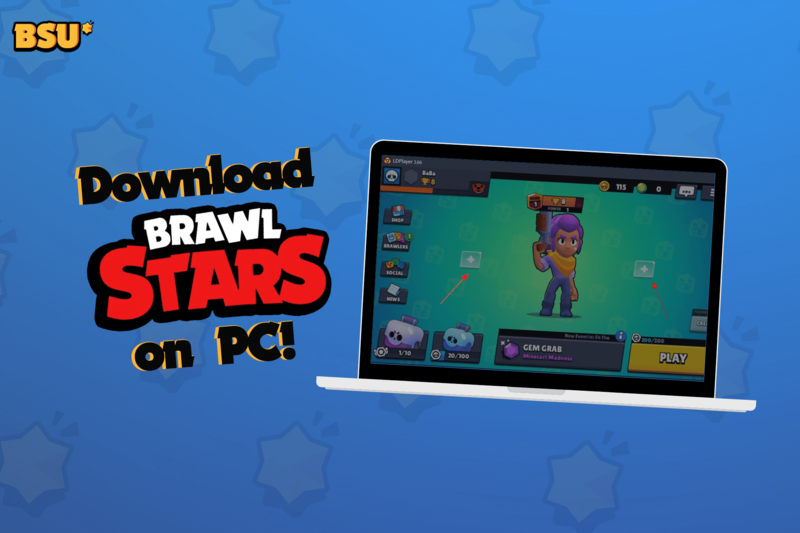 You Should Download and Play Brawl Stars Now! There are many great game apps available for your smart phone that is difficult to decide which one is ideal for yourself. Some love more of the action kind of games, while others choose strategy, and still others like puzzle kinds of apps. It is really simply a matter of taste that will drive a person to select the game that is ideal for them to use on their phone. One that is really capturing the attention of game players everywhere is Brawl Stars. If you are unfamiliar with this game, then you are really missing out. Supercell has long been known for creating fantastic games that have been some of the best that iOS users have found in terms of game app creators. After starting with such classics as Clash of Clans, Boom Beach, and Clash Royale, the newest spinoff has quickly garnered the attention of game players everywhere, because of the fantastic graphics, great story, and action that you are able to enjoy. There simply doesn’t seem to be a bad game that Supercell has created in the series. You would think that it would be hard to top previous additions, but Brawl Stars simply continues to line of fantastic games that users will truly love. The fact that they are free download that you can enjoy, only makes them a more desired application for iPhone and iPad users. Supercell has become one of the leaders in creating ideal applications for mobile devices. They not only are able to create fantastic building games, farming games, and also card games, but have taken their game to another level in this particular genre as well. What makes Supercell such a fantastic company, is that they stand how one needs to create MOBA kinds of games that really work for consumers. It’s not easy to create these kind of games, because it is hard to generate fantastic graphics and user interfaces, while also generating storyline that is interesting and entices users to return to play. Add to it the need to hire top-notch programmers who cannot only generate great MOBAs that consumers will love, but also which can be developed in several different platforms and it is easy to see why Supercell has become one of the leaders in the mobile application genre. When you think about the number one problem that game developers face is the fact that people don’t have a lot of time to stare at their phone to play a game. The fact remains that while the vast majority of people spend four or five hours on their phone each day, they are probably spending at least 90 percent of that time on social media, talking on the phone, or sending text messages. That gives them little amount of time to be able to perform other tasks. For game developers, you have to be able to create a game that either allows users to be able to play a scenario to completion in a very short period of time, or which entices them to continue to play for longer periods of time. That’s not the easiest thing to do when the attention span for most people is getting to be no more than just a few minutes. Fortunately, Supercell has found a way to do just that. Not only have they created a game that allows you to play simulated battles and scenarios in a short period of time, but you will find that putting the game down will be difficult to do. It is a fantastic role-playing kind of game, that’s ideal for any device that you use. Not only do you have the advantages of playing shorter play sessions in game modes, such as the 1v1 mode, but there are also other options that allow you to be able to extend out your time, even joining in on team battles to extend the fun for a longer period of time. These modes allow you to join with other players and battling different villains in several different scenarios within the game, and allow you to choose the character with which you would like to play and the teammates as well. The scenarios are set to last no more than five minutes, giving you a great MOBA experience that will keep you entertained and ensure that you can squeeze in the time necessary to be able to play the game. However, Brawl Stars still provides you with complicated scenarios that will keep you focused on playing the game and give you a reason to return. A lot of games may work within the timeframe that allows you to play them, the action or scenario involved in the game simply doesn’t peak your interest to make it enjoyable enough. That is not an issue with Brawl Stars which make sure that you can have a lot of fun playing the game while making it something that is captivating to your mind. While there is a lot to find enjoyable about this game, one thing that really separates it from the vast majority of other games that you would play is the fact that it has its own unique storyline behind it that makes it worth playing. Too often, people will play games and asked themselves why they should be playing this one option when there are at least one other game that is just like? This is a common problem found with many of the games you would download out there, but not with Brawl Stars. Here you will find a unique game that is quite enjoyable to play because of the uniqueness of it. You won’t be saying that it is comparable to another game or another group of games out there. Instead you will enjoy the fact that it comes with its own storyline, characters, and design that will make it enjoyable for you to play for hours. And the very best part about it is that this game is 100% free for you to download and enjoy. Fancy enough to download Brawl Stars now? Another thing that separates Brawl Stars from many of the other games you will find out there is that it provides you with a few different scenarios that you can enjoy playing. Not only are you able to join real-time battles that are occurring, joining other partners with your character, but you can also engage in individual battles in the 1v1 mode, or also choose a couple of teammates in the 3v3 scenarios. This gives you a whole lot of opportunity to enjoy the game depending on what kind of mood at that moment. When you install and activate the game, one of the characters that becomes available to you is Shotgun Shelly. This is a shotgun wheeling brawler that is ready to do battle with the best of them. She not only comes with a powerful weapon, and skills that make her great to be able to do battle with, but you can enhance the character and grow with her more that you play the game. There are also other player options out there for you to choose from, giving you the ability to choose characters that fit your particular preference in terms of weaponry and ability to protect themselves. This makes it so that your experience with the game, no matter which mode that you are in, is as enjoyable as it can possibly be. This is as much fun as you could possibly imagine playing a MOBA on your smart phone or tablet. Currently, there are 15 different characters that are available for you to be able to unlock. Each of these characters abilities, including how many hit points it is able to generate each time it fires, how great its defensive skills are, and its own particular style points. The more that you play this, the more enjoyable to play as you can change characters and improve or change your powers. With a game like this, someone quickly gets turned off by it because it can be rather complicated to play. The learning curve can be so steep that they find themselves turning it off after a few plays because they simply don’t enjoy the game while trying to figure out how to play it. This is not a concern with Brawl Stars, which offers you several different help modes that can assist you in learning how to play the game. Best of all, they are not tedious instructional guides that can be as complicated to view and learn what it is that you’re supposed to do as it is to actually play the game. This is not a problem with Brawl Stars they provide you with as detailed of an explanation as you need. 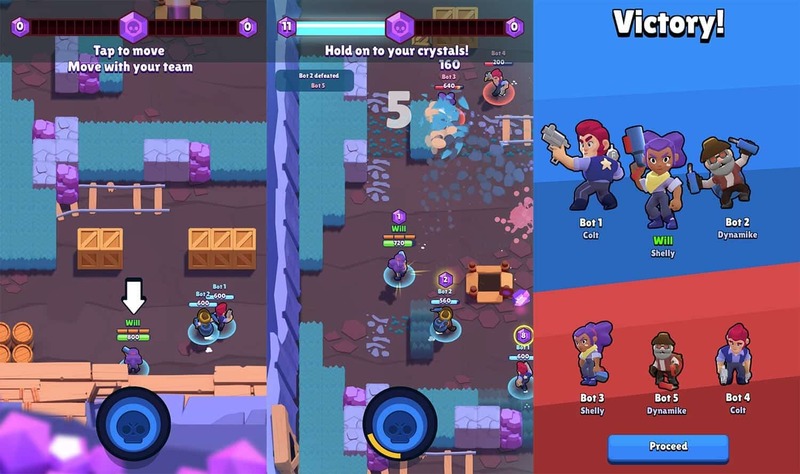 By being able to use these helps and tutorials, you will quickly learn how to play and enjoy the game, so that you can work your way through the different kinds of scenarios and modes that Brawl Stars has to offer. This will ensure that you will know how to engage in 1v1 mode, 3v3 mode, and team play, making this whole lot more fun for you. If this doesn’t sound like enough features to make this a game you will love playing for hours, then consider some of the additional features that are offered to you that separated from many of the games you will find out there one that you will truly like is the fact that you can use of virtual joystick to play the game. Many love this option to be able to control the action of the game. If this is not for you, then you don’t have to use this feature, giving you greater flexibility. There are four total game modes available for you to enjoy, which also means that there are four slots that are available so that you can play each of these modes and return without having to lose where you were at in a previous mode you were playing. This is one of the things that many people enjoy, because it gives them the ability to play all four modes at any time during the day, returning to the specific mode they wish to play at that particular moment. Think about the fact that you can focus on one particular mode of game for a number of days, and then returned back to one of the other ones, such as Showdown or 1v1, without losing with either game. Few games offer this kind of functionality, and is one thing that is really separating from other MOBA games you will find out there. Another great feature you will like about Brawl Stars is that bonuses, such as coins and other rewards, that you earn in one mode are available for you to improve any character that you are using, even if it is in one of your stored spots for another mode. This makes it so that you can reap the benefits of playing the game in any mode, being able to reward your players for the successes that you are having. Fans are looking for a way to find a game that gives them hours of enjoyment, while also ensuring that they are able to play the game in a span of a few minutes at a time. This is exactly what Brawl Stars does for you. It makes it so that you get a game that will be fun for you to play while also keeping you captivated enough to want to continue to play over and over again. Few games offer this kind of enjoyment, and is one of the reasons why Brawl Stars is so popular with millions of players around the globe. It does not matter what kind of device that you have, you will find this game to be one that you will spend hours playing every day. What are you waiting for? Download the game right now!